When Neon Dreams started out, image was not the point. 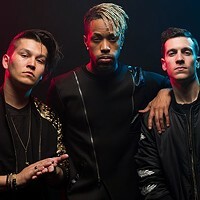 “We were trying to figure out our sound and how we were going to play,” says drummer Adrian Morris, “trying to do EDM as a band, how we were gonna do that.” Now that that’s been handily sorted and spun into radio hits, there’s the other side: The internet. Neon Dreams’ consistent and slick social media presence has a full-time handler, Haligonian Chris Lauer. “He’s this kid we saw on Instagram that was building this buzz based on his photography,” says Morris. “We went, ‘This is really cool, how would you like to come on the road with us?’” You definitely like what you see, smashing that like button all the way to a gold win.